Samsung's Infrared Blaster (or IR Blaster) is a device that transmits an infrared signals. It controls a device that is normally operated only by remote control key press. Firstly, IR blaster needs to be paired with the Samsung’s Smart TV via Bluetooth. The most common use of an IR blaster is to allow a device to change the channel and control the options on an external device such as a cable box, set-top box, blu-ray player, DVD etc. ● IR Blaster enables us to control connected external devices with TV using the Smart Touch Control. ● IR Blaster sends an IR signal into a corresponding external device. ● Gives freedom to operate connected devices through gesture and voice. ● Power switch to turn ON/OFF an IR blaster in order to save batteries life. ● Pairing button enables us to get connected with Smart TV via bluetooth. ● IR Blaster must be located nearby with external devices connected to the TV. ● There should be no obstacle between the external device's IR receiver and an IR Blaster. 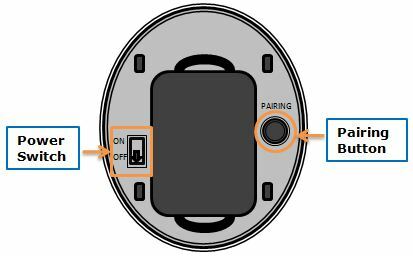 ● Install the IR Blaster within 50 cm and 45 degrees of the up, down, left and right directions of the IR sensor of the external device. ● If you control an external device by using the Smart Touch Control, the IR Blaster sends an IR signal into a corresponding external device.